With the rise of e-commerce, The North Face found that their retail experience was flat. The challenge was to create an inspired way to highlight the benefits of their FuseForm jacket and drive foot traffic into their retail outlets. 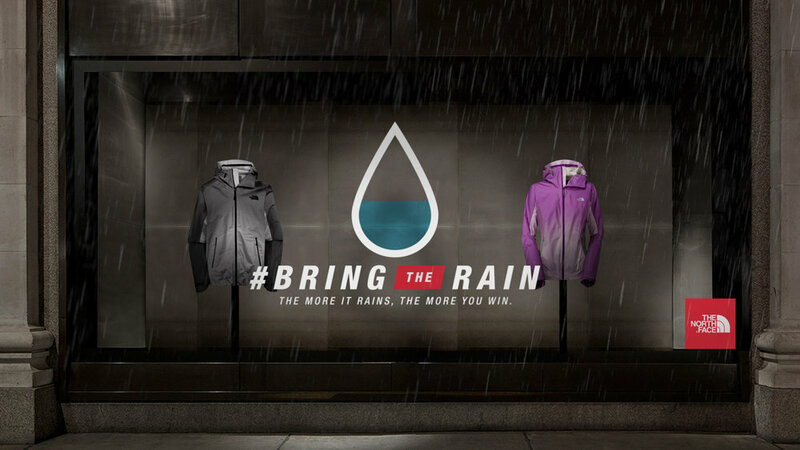 The first real-time, weather-activated retail campaign. The more it rains, the more chances there are to win a free FuseForm jacket. Using national weather data, users were notified through social every time the rain gauge collected more rain. When the threshold was met, the contest was live and people had 24hrs to get to a North Face store in an attempt to win a free FuseForm rain jacket. The launch of the FuseForm jacket was a big success. Over the course of the campaign they saw a 20% increase in visits to The North Face flagship stores and they experienced a gigantic mobile spike of 91%. Boom!